Black ‘n Blue Ball 2009 | Hupy and Abraham, S.C.
Julie Egide, Dave Charlebois, Vicki Sanfelipo, Tiger, Diane Rodd and Teri Beyer. Every year on the first Friday in May, Harley-Davidson hosts the Black ‘n Blue Ball to benefit the Muscular Dystrophy Association. Attorney Jason Abraham, one of the owners of Hupy and Abraham, sits on the committee that organizes the Black ‘n Blue Ball and the law firm purchased four corporate tables, instead of three as in past years. Forty people attended the ball as guests of Hupy and Abraham The firm usually invites local riders, clients and dignitaries. In the past, these dignitaries have included artist and actor Ray Kelly, musician and Harley-Davidson historian Martin Jack Rosenblum, and New York fire fighter Bill Eisengrien (one of three fire fighters memorialized in that famous flag raising photo after the attack on the World Trade Center). Among the riders at the four Hupy and Abraham tables were ABATE of Wisconsin Executive Director Greg Rodd and his wife Diane, Rescue Riders founder Dean Akey and his wife Eileen, ABATE Milwaukee Region Representative Paul Vita and his wife Lynne, Milwaukee Harley-Davidson dealership owner Chaz Hastings and his wife Laura, A.B.A.T.E. 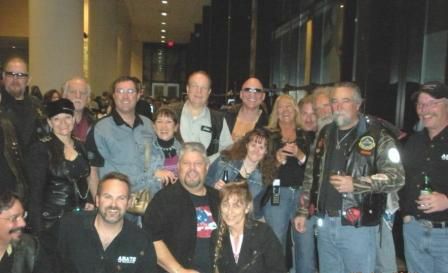 of Illinois, Kishwaukee Chapter member Charlie Fruit and many other local ABATE members and officers. The Black ‘n Blue Ball in Milwaukee is the largest fund raiser of this type in the country benefitting MDA. This year the Black ‘n Blue Ball raised just under $500,000 for the MDA.